As the capital of Malaysia, Kuala Lumpur is always surrounded by a large amount of transportation going in and out of the bustling city. You can catch a ride at numerous pick-up points that is near you. 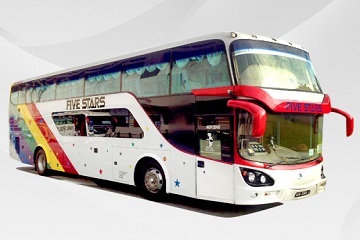 If you are based around the Petaling Jaya area, you would want to book a bus ticket with Five Stars Travel Sdn Bhd. The headquarter for this express bus company is a ticketing representative for various operators is currently based at 1 Utama Shopping Centre in Kuala Lumpur. 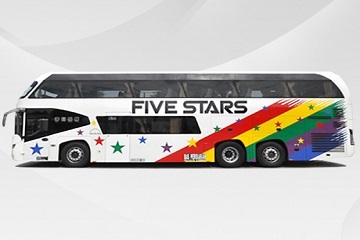 You can now conveniently book your Five Star Travel bus tickets over here at Easybook website without having to leave the comfort of your couch. 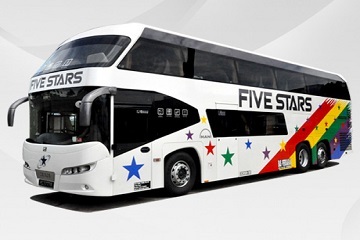 Upon booking your bus tickets with Five Stars Travel, you will be boarding their 44-seater coaches that are available on single deck vehicles. Most of their vehicles are equipped with a television so you are able to enjoy some entertainment while you are heading to your destination whether it is for business or pleasure. You can even take this time to also catch up with an episode of your favourite TV show on your electronic devices or simply read that book you have been putting aside for months. If you are travelling to Genting Highlands in Pahang, the pick-up point for Five Star Express is also located at 1 Utama Shopping Centre for the convenience of travellers around the neighbourhood. The drop-off point for Five Star Travel in Genting Highlands is at Awana Skyway Lower Station. Having 1 Utama Shopping Centre in Kuala Lumpur as a pick-up or drop-off point makes it very easy for anyone who needs to grab a quick bite before or after their journey. You can find everything you need under one roof for all your everyday needs, or simply catch a movie even. Awana Skyway Lower Station in Genting Highlands is also connected to a shopping mall called Genting Highlands Premium Outlet. Just one minute walk away, Genting Highlands Premium Outlet is where you can find discounted clothing items from different designers and brands on a daily basis. 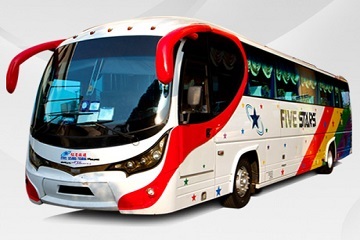 The next time you are planning to travel to between Kuala Lumpur and Genting Highlands, make sure to book your bus ticket online with Five Star express bus. Easybook provides you with a very easy-to-use platform whether you want to purchase them through the website or mobile app. You will be able to save a tremendous amount of time when you book a bus ticket with Five Star Travel with Easybook without having to leave the comfort of your home or office at all. Lot No. G-05B, Ground Floor, Berjaya Times Square, (Next to Papajohn), Jalan Imbi, 55100 Kuala Lumpur, Malaysia. Lot L4-5A / 5B, Level 4, Terminal Bersepadu Selatan (TBS), Jalan Terminal Selatan, Bandar Tasik Selatan, 57100 Kuala Lumpur, Malaysia. Lot BT2, LG Floor, 1 Utama Shopping Centre, 47800 Bandar Utama, Petaling Jaya, Selangor, Malaysia.